The Italian Hall, the compositional centre of the palace, belongs to the suite of state apartments. It is practically a replica of an antique Roman temple with its noble proportions. The high coffered dome with a round glazed aperture in the roof, modelled on the "eye" of the Pantheon, the arcaded gallery in the second tier, and the alternating flat and semicircular niches underneath, create an impression of tranquility and balance. The strict symmetry, structural clarity, and distinct horizontal articulation achieved by the use of moulded cornices and friezes, are all typical features of classical, architecture. The Italian Hall was never completed by Cameron. The design for its interior decoration was drawn up by Brenna; after the fire of 1803, Voronikhin added the caryatids in the Egyptian style, the gallery balustrades, the figures of eagles on the upper cornice, embellishments over the doors, and other details. 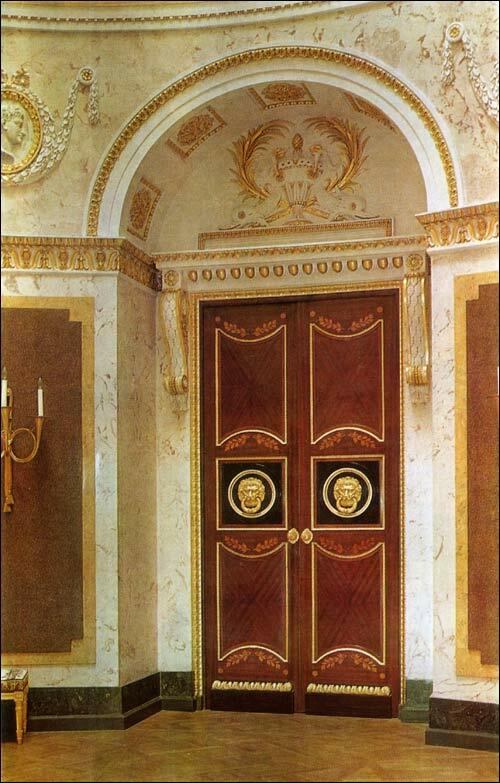 The wooden doors inlaid with coloured woods and decorated with ormolu are after a sketch executed by Giacomo Quarenghi. Colour plays an important role in the decorative scheme of the Italian Hall. The pale pink of the dome, and the pink and lilac of the stucco facing of the walls, are emphasized by the dark border below, of a colour imitating porphyry. Sunlight pours in from above into the half-darkness of the interior and reflected by the polished marble circle on the floor lights up the recesses and throws reflexes on the marble statues. 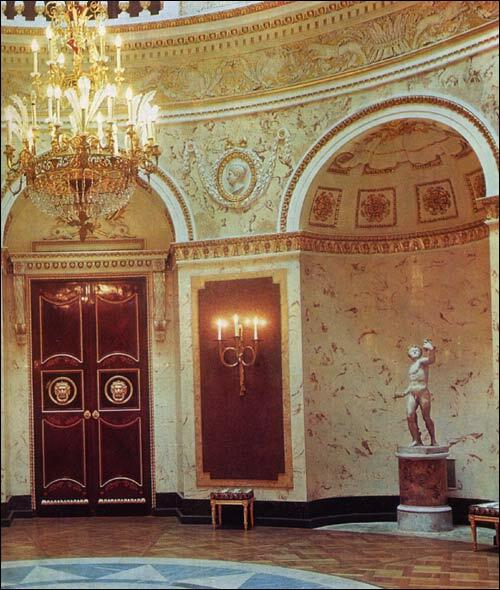 The white and gilt stucco-work of perfect workmanship, done from Brenna's drawings, adds to the dignity of the hall. The sculptures of the Italian Hall are excellent Roman copies made in the first - third centuries AD from Greek originals dating back to the fourth - third centuries BC: Dancing Satyr and Satyr with a Flute of the school of Praxiteles, and Eros Stringing His Bow by Lysippos. The Eros is particularly remarkable for its rare state of preservation. Antique Roman bas-reliefs in medallions, inset in the stucco facing of the walls, complete the hall's atmosphere of antiquity. After dark the Italian Hall was lighted by sconces in the shape of althorns adorned with ribbons, and by a chandelier of unusual design. The bronze frame of the chandelier is exquisitely chased, its stem is shaped like a vase of ruby glass, and the festoons of crystal drops, the pendants, and the "ostrich feathers" of crystal beads, sparkle and gleam like diamonds. 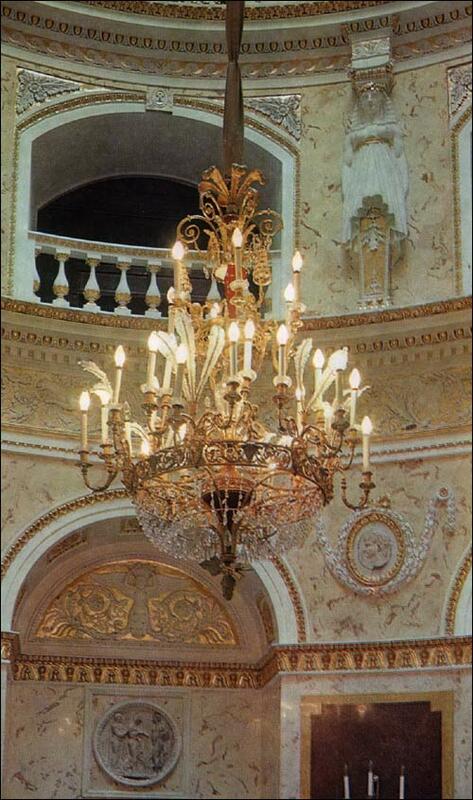 No doubt the chandelier was designed by a master of the first rank: sketches for lighting fittings of all kinds were usually made by eminent architects like Giacomo Quarenghi, Nikolay Lvov, Andrey Voronikhin or Carlo Rossi. The Italian Hall is a remarkable example of an interior finished in the style of late eighteenth-century Russian classicism.